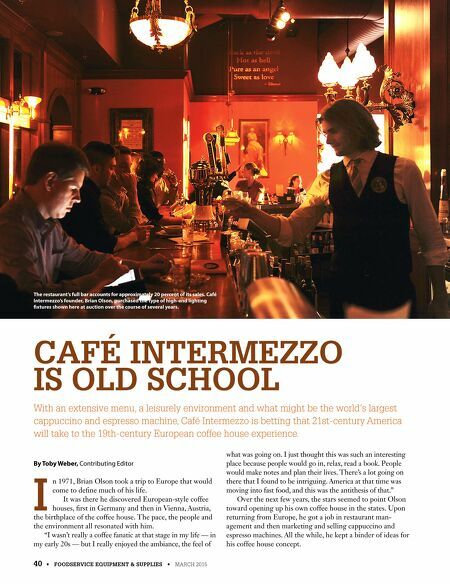 40 • FOODSERVICE EQUIPMENT & SUPPLIES • MARCH 2015 CAFÉ INTERMEZZO IS OLD SCHOOL With an extensive menu, a leisurely environment and what might be the world's largest cappuccino and espresso machine, Café Intermezzo is betting that 21st-century America will take to the 19th-century European coffee house experience. 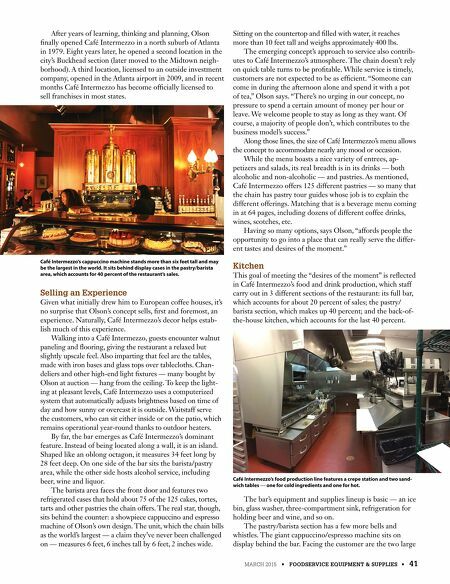 The restaurant's full bar accounts for approximately 20 percent of its sales. Café Intermezzo's founder, Brian Olson, purchased the type of high-end lighting fxtures shown here at auction over the course of several years. By Toby Weber, Contributing Editor I n 1971, Brian Olson took a trip to Europe that would come to defne much of his life. It was there he discovered European-style coffee houses, frst in Germany and then in Vienna, Austria, the birthplace of the coffee house. The pace, the people and the environment all resonated with him. "I wasn't really a coffee fanatic at that stage in my life — in my early 20s — but I really enjoyed the ambiance, the feel of what was going on. I just thought this was such an interesting place because people would go in, relax, read a book. People would make notes and plan their lives. There's a lot going on there that I found to be intriguing. America at that time was moving into fast food, and this was the antithesis of that." Over the next few years, the stars seemed to point Olson toward opening up his own coffee house in the states. Upon returning from Europe, he got a job in restaurant man- agement and then marketing and selling cappuccino and espresso machines. All the while, he kept a binder of ideas for his coffee house concept.